Financial literacy curriculum written by Juniper Shore Publications was unveiled at the White House Summit on Financial Capability and Empowerment in May 2012. VISA's Practical Money Skills Course is a comprehensive and free curriculum for 9th through 12th grade students designed to promote stronger financial awareness and planning. JSP was responsible for crafting the 22 engaging lesson plans including student-centered activities, which align to national standards for financial literacy and economics, as well as Common Core Mathematics and English Language Arts standards. To learn more about the project, view JSP's portfolio or access the curriculum package through the Top Ten Education Downloads on iTunes. 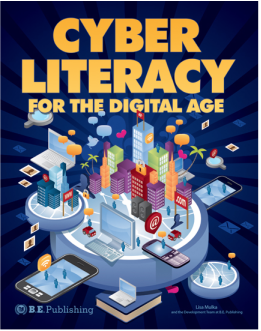 JSP is excited to announce the recent release of Cyber Literacy For The Digital Age, a comprehensive textbook addressing twenty-first century technology and literacy skills. From cyber bullying to netiquette, middle and high school students explore the digital age in inquiry-based activities, real-world readings, and contextual scenarios that connect complex issues to students' daily encounters with technology. JSP was responsible for authoring the full text, including the development of 19 chapters within 5 units of study. In addition to the student textbook, we assisted in the development of a teacher's guide and supplemental teaching materials including assessment items and rubrics. The textbook aligns to Common Core State Standards, as well as NBEA and ISTE. For more information about this project, visit our online portfolio. Copies of Cyber Literacy For The Digital Age, can be purchased through BE Publishing here. JSP serves as the ongoing copyeditor for the curated grant entries and is responsible for editing over 2,000 active grants currently available on the website. Find more information about this project, visit our online portfolio.